Create clear & predictable visual schedules and checklists for people with special needs. Often a person with special needs is greatly helped by providing structured and predictable day-to-day schedules. But creating them can be quite difficult and time consuming. What should I do now? What is going to happen this week? Often this uncertainty can cause stress and anxity for people with special needs. 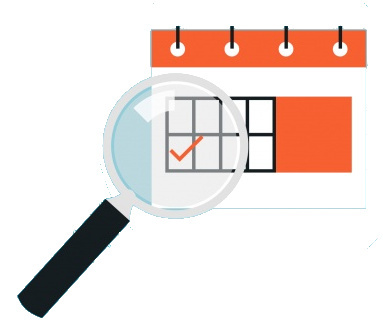 A clear daily schedule with easy-to-understand language and supporting photos, pictograms, videos and colorcoding can offer a solid foundation. Providing structure and predictability where it is needed. 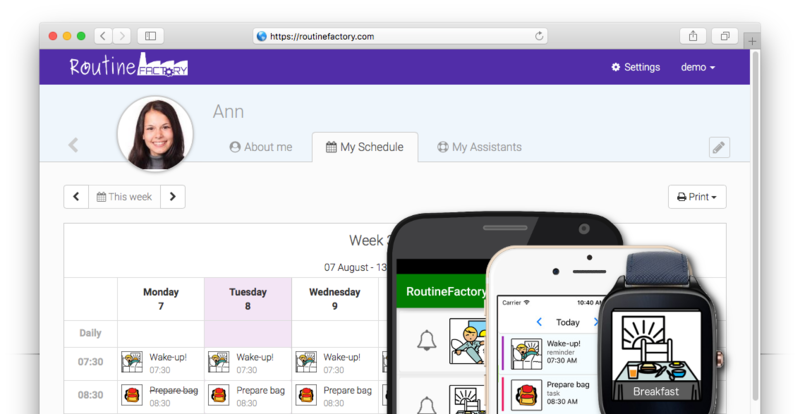 The online portal in RoutineFactory let's you easily create and maintain visual schedules. You can add as much detail as needed and really adapt the schedule to a specific person! 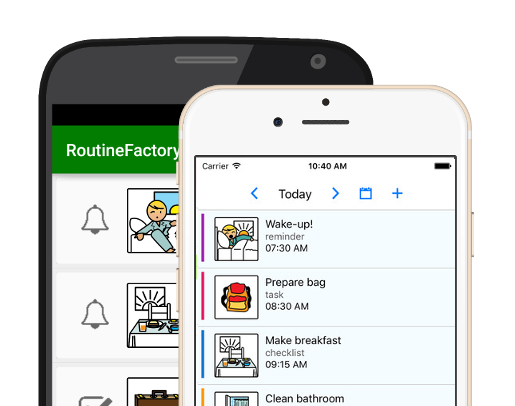 RoutineFactory contains tools to help make a day program easier to understand and use. It is a lot more than a simple calendar. For example: you can split a complex task in smaller easy-to-follow steps, provide help with choices (I have a free hour; what should I do? ), track emotional state and much more. The reward system helps with motivation using point collection & rewards. 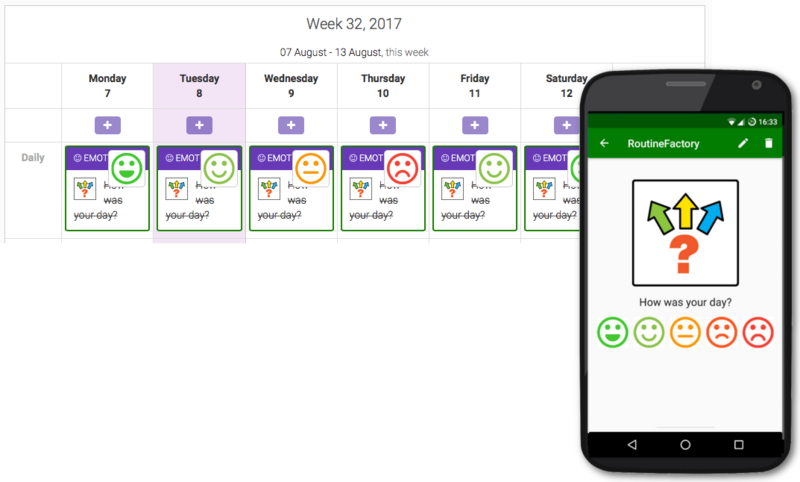 Digital assistance can provide step-by-step instruction in specific situations, for example doing chores. 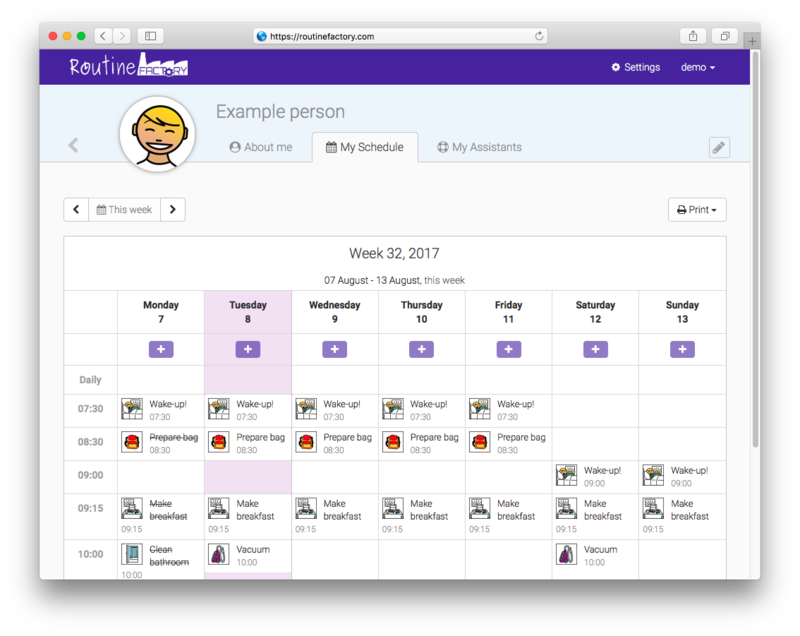 The online portal lets you create and manage visual day programs, create digital assistants and follow progress. Not just for a caretaker but (if possible) also for the person using the schedules and the network, family & friends. In this way everyone is on the same page. Clear communication via messages and always an up-to-date overview. You can access the online portal from anywhere from your webbrowser. No software to install or maintain. or with the digital information boards to create a consistent foundation. RoutineFactory is adaptable to the situation and needs for a person with special needs. It is already daily used by hundreds of families and multiple professional care organisations. You can test for free for 14 days, no obligations or commitment.